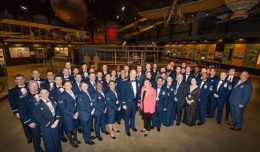 Maj. Benjamin Meier’s family gathers with his 31st Test and Evaluation Squadron in Hangar 1810 Dec. 8, 2017. 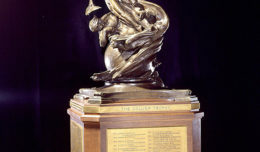 The squadron helped decorate Meier’s floragrarph, which will be placed on the Donate Life America 2018 Rose Parade Float to honor his memory and lifesaving gifts of organ donation. The memory of former 31st Test and Evaluation Squadron pilot Maj. Benjamin Meier lives on amongst family and friends. This New Year’s Day, Meier will be honored at the 129th Annual Tournament of Roses Parade in Pasadena, Calif., for the gifts of life he gave to several people following the tragedy that took his life in 2015. A handmade floragraph with Meier’s likeness will be part of the Donate Life America Rose Parade Float. According to the organization, the Donate Life America Rose Parade Float is part of a national effort of more than 50 organizations that have teamed up to deliver a message that becoming an organ donor can help save and heal lives. 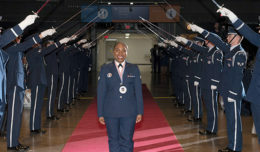 Airmen of the 31st TES joined Meier’s family in a ceremony at Hangar 1810 Dec. 8 where his squadron finished decorating the floragraph. The squadron got the opportunity to place their own touches on the floragraph and added Meier’s call sign “Chex” on his uniform and signed the back of his portrait. The floral portrait is made of dried flowers, seeds and spices, and will be placed on the Donate Life America Rose Parade Float. 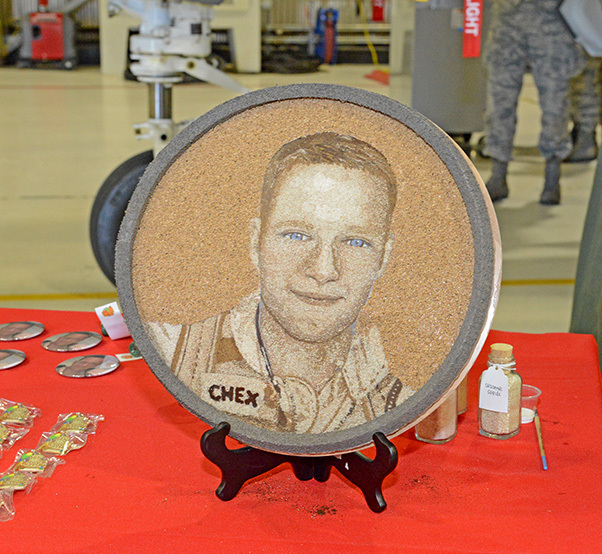 A handmade floragraph with Maj. Benjamin Meier’s likeness will be part of the Donate Life America Rose Parade Float. The floral portrait is made of dried flowers, seeds and spices. According to the organization, the Donate Life America’s Rose Parade Float is part of a national effort of more than 50 organizations that have teamed up to deliver a message that becoming an organ donor can help save and heal lives. While on a morning run in 2015, Meier was struck in the head by the mirror of a passing truck at Edwards Air Force Base, Calif. A Donate Life America release says he was declared brain dead less than 24 hours later. An organ donor, Meier was able to provide his heart, lungs, liver and kidneys to people who live on to this day. Donate Life America says a single organ donor can save the lives of up to eight people and improve the lives of as many as 75 more by donating their corneas and tissue. 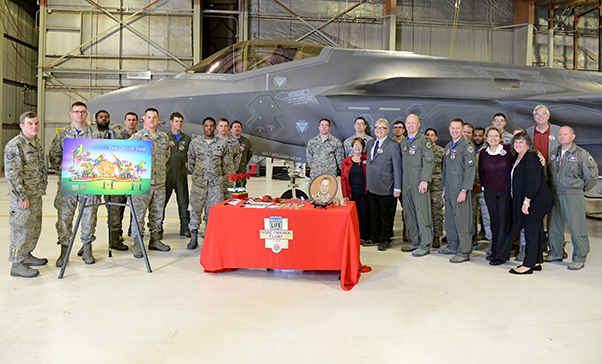 Meier was a combat veteran who received the Air Force’s Air Medal before flying F-35s as part of the 31st TES’ operational test and evaluation mission. He is buried at Arlington National Cemetery and is survived by his wife, two young sons, two sisters and parents.